Crisis Mapping the End of Sudan’s Dictatorship? Anyone following the twitter hashtag #SudanRevolts in recent days must be stunned by the shocking lack of coverage in the mainstream media. The protests have been escalating since June 17 when female students at the University of Khartoum began demonstrating against the regime’s austerity measures, which are increasing the prices of basic commodities and removing fuel subsidies. The dissent has quickly spread to other universities and communities. There’s no doubt that Sudan’s dictator is in trouble. He faces international economic sanctions and a mounting US$2.5 billion budget deficit following the secession of South Sudan last year. What’s more, he is also “fighting expensive, devastating, and unpopular wars in Darfur (in the west), Blue Nile, Southern Kordofan, and the Nuba Mountains (on the border with South Sudan)” (UN Dispatch). So what next? Enter Sudan Change Now, a Sudanese political movement with a clear mandate: peaceful but total democratic change. They seek to “defeat the present power of darkness using all necessary tools of peace resistance to achieve political stability and social peace.” The movement is thus “working on creating a common front that incorporates all victims of the current regime to ensure a unified and effective course of action to overthrow it.” Here are some important videos they have captured of the protests. The crisis map includes over 50 individual reports (all added in the past 24 hours) ranging from female protestors confronting armed guards to Sudanese security forces using tear gas to break up demonstrations. There are also reports of detained activists and journalists. These reports come from twitter while more recent incidents are sourced from the little mainstream media coverage that currently exists. The live map is being updated several times a day. As my colleague Carol Gallo reminds us, “The University of Khartoum was also the birthplace of the movement that led to the overthrow of the military government in 1964.” Symbols and anniversaries are important features of civil resistance. For example, Sudan’s current ruling party came to power on June 30th, 1989. So protestors including those with Sudan Change Now are gearing up for some major demonstrations this Wednesday. This is not the first crisis map of protests in Khartoum. In January 2011, activists launched this crisis map. I hope that protestors engaged in current civil resistance efforts take note of the lessons learned from last year’s #Jan30 demonstrations. For my doctoral dissertation, I compared the use of crisis maps by Egyptian and Sudanese activists in 2010. If I had to boil down the findings into three key words, these would be: unity, preparedness, creativity. Unity is absolutely instrumental in civil resistance. As for preparedness, nothing should be left to chance. Prepare and plan the sequence of civil resistance efforts (along with likely reactions) and remember that protests come at the end. The ground-work must first be laid with other civil resistance tactics and thence escalated. Finally, creativity is essential, so here are some tactics that may provide some ideas. They include both traditional tactics and technology-enabled ones like digital crisis maps. NB: I understand that the security risks of using the Ushahidi mapping platform have been indirectly communicated to the activists. This entry was posted in Crisis Mapping, Crowdsourcing, Digital Activism, Social Media and tagged #Jan30, #SudanRevolts, civil, Protests, Resistance, Sudan. Bookmark the permalink. On June 23rd 2012 my colleagues from the Conflict and Coexistence Program at Brandeis Ameer Elnager and Rania Farouk, both Sudanese began curating the facebook group called Follow the Sudanese Revolts: http://www.facebook.com/groups/381302298598266/ While it is mostly in Arabic – it is a great resource of citizen media from the ground. 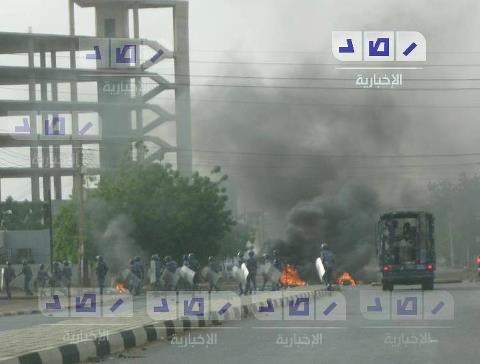 Like its the Twitter hashtag – #SudanRevolts it is a storehouse of stories and updates about the situation. Below is a blog written by Crisis Mapper and ICT Thinker Patrick Meier highlighting many initiatives that have organized the protests; including crisis mapping, social media and the google wiki (living document) based on Gene Sharps 198 Non-Violent Methods 2.0. As usually Patrick says what he does very well and is worth a read. Maybe the media is not covering it because the CIA/ US State Department is not bankrolling the resistance? It is so sad that Africans do this to each other. What is wrong with my nubian brothers and sisters?